Thank you for all the book suggestions, folks! I just sat down and created a huge checkout list from my library. My local library can be accessed online. I can reserve books and have them "sent" to a drive-thru window where I pick them up and checkout. It’s pretty much what keeps my reading life alive b/c any time spent at the library is usually spent downstairs in the children’s department. Now if I could just find a grocery store with a drive thru window…. Strawberries aren’t quite in season here, but were are just on the cusp. So I’m getting ready because I’m pretty much a strawberry fanatic. My grandmother told me that you should only wash the serving of strawberries you are going to eat because they spoil more quickly after you’ve washed them. So armed with that wisdom, I now only wash a handful at a time. This ritual had me thinking how much I wish I had a tiny collander to wash my one serving of berries. So I emailed my genius potter friend, Melissa and described what I was looking for and offered a swap for her design and potting services. And on the topic of food, I made this snack for the girls today which is straight from the latest issue of EDF’s after school snack section. Oh.My.Man. as my children would say. It is so good–cinnamon swirl bread, toasted. Plain cream cheese. Apple slices. Oh geez. Try it. Yesterday, I called my mom on the phone. The woman makes the best salads in the world. So as I was making out my grocery list this week, I called to ask what key ingredients I needed to make a mom-esque salad…She really doesn’t know exactly what makes them so good. They’re these clean out the refrigerator, never the same twice kinds of salads. But her guesses were the cheese–feta. The olive oil and balsamic vinegar. Salt and pepper. Those were the base of almost every salad. 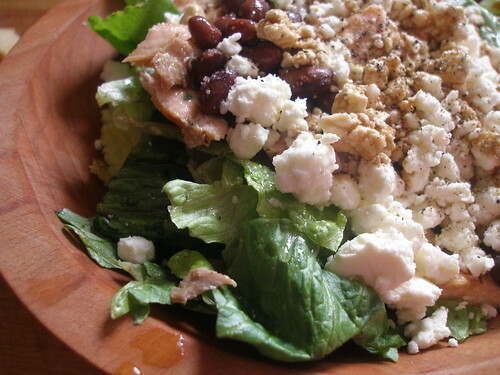 So today, I made one for lunch–using the same base and adding some leftover grilled salmon, and some black beans. It was really, really good and filled me up for the rest of the day. (It’s 4:30 right now.) Now if only I’d made some crackers to go with it. I’m still doing my weekly meal planning and I’m not sure I’ll be able to turn back. It is so helpful. (Although this week, I was a few days behind on my big shop and had to leave a "Dear John" letter on the fridge for Dan about his breakfast that wouldn’t be there for him.) But unfortunately my grocery bill keeps creeping higher and higher. Gone are the days of the $79 shopping trip. These grocery prices are making me want to add an extra acre to my garden. I saw a gallon of organic milk for seven dollars! I did not know that about strawberries. And as I’m going berry picking tomorrow (here’s hoping it doesn’t rain!) that’s good to know! I know what you mean about the groceries– a friend and I went on a little for-fun trip to Whole Foods on Sunday and left feeling like it was a museum for food, because with prices, you surely would not be buying any! But on the plus side, my tomatoes have blossoms on them and the lettuce is still doing well. I’ll declare victory when I make my first fajitas with my own peppers. woooooowwwww. i am in love with your salad, and wish i had a big bowl of it in front of me! and your new colander is to die for. you are a lucky girl! I am SO happy you liked the berry bowl! Thanks for the love! I’m making more next week. . . . I had two grocery/Sams trips this week. The sam’s typical $70 was $98, but happily the grocery tally that I thought would be $60 was only $68. Time to plant those green beans and reseed mesclun! Salads and snacks look excellent. Oh! That salad looks heavenly! I love feta on my salads as well. I had a recipe for a wonderful greek salad that was the best- if I can find it I’ll send it to you. I haven’t tried the apple cream cheese combo, but I think I must. Looks delish! I was hoping you were going to say you had a good batch of yogurt. I’m really hungry now, thank you very much. Love that strawberry bowl. you are speaking my strawberry language. i’m all over that cup. i want that cup too. so dang cute! I *just* not 20 minutes ago sadly threw out my pottery berry bowl as it got broken.. so sad.. but now you have given me hope!Thanks! love the strawberry cup. 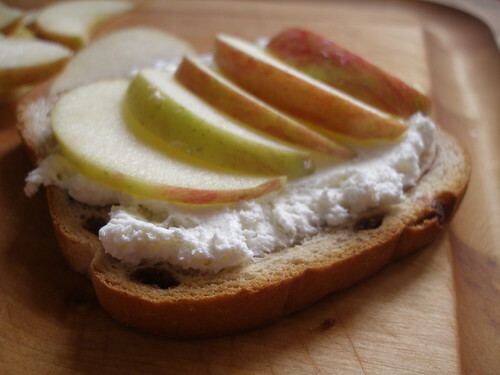 must try the apple/cream cheese/cinnamon swirl bread. wish our library had a drive thru. and the organic milk – the regular price is $6 at the store, which means i’m getting a real bargain (not) when i get it for $5.50 at costco 🙁 an extra acre would be good, as would a raw diet. mmmmm, balsamic vinegar and olive oil, forgot about that combo. thanks for the salad tips, i’m loving my salads at the moment. my favorite is lettuce&spinach, avocado, sun seeds, with a lemon/olive oil/garlic dressing. it really is easy and oh so yummy. A drive thru library window? Wow! I need that! I love your berry bowl. Too cute and very useful. I have written down the dressing recipe above-thankyou Corynne.I am planning on eating some variation of your yummy salad tomorrow.I know what you mean about the groceries.I cannot walk out of the organic market without parting with at least $100!! And thats before shopping everywhere else aswell.Oh for a bigger vege patch.And a cow……. The meal planning just makes all the difference in the world, doesn’t it? It seems so hum-drum, but it can change your life. And I didn’t make it to the store this week either, which meant waffle Friday was out this week. Hey, ho! Have a great weekend, Molly. And happy mother’s day. Wow! 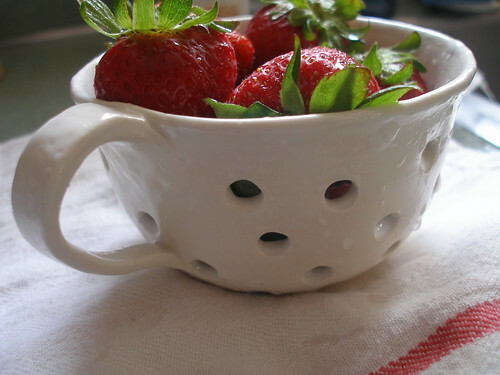 What a cool colander! I can’t wait to order one. My little man loves strawberries so much I have to serve them with every meal. This will make it a lot easier to clean them that’s for sure! Good heavens, I want to crawl up on that toast and rest my head on that cream cheese pillow! Your photos are so CRISP (and I hate using that word, hurts my mouth). That cup is beautiful, and so are your photos.I am amazed at the amount of my grocery bill each week. It just keeps getting higher and higher, and with 2 growing boys that will only increase!I love your food posts. Umm. That strawberry bowl is the best. idea. ever. Really. Must have one!!! Grocery prices are totally insane. We have had a super busy month, so we were out of everything, including every last crumb of sugar. It cost me nearly $250 to restock the pantry and such. Sigh. Yummo! Wanna go strawberry picking? Did you get my msg. that next Tues. works well for us? At your new place would be great! 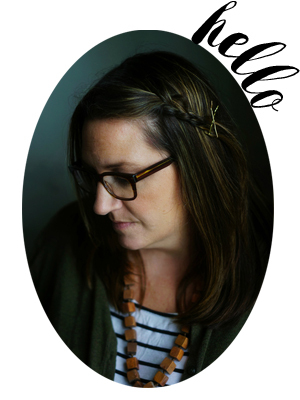 Melissa’s etsy shop has some beautiful things in, I have bookmarked it so that I can look at it again. Thank you for sharing her shop with us I think I shall certainly be making a purchase from it. Speaking of balsamic vinegar and strawberries… Have you tried them together?? Oh my stars it is wonderful!! Just sprinkle your handful with a teaspoon or so to start and the same amount of sugar if you need or want it. YUM!!! I even eat that combo on vanilla ice cream(‘cept I don’t use the sugar).